School is back in session! After the clothes, the supplies and the backpack have been purchased there is one big item left…the lunch box! We want to help our children feel more independent, but sometimes kids with special needs need some special assistance with this portion of their school day. Also, many in this population have very specific dietary needs and wants. Here are some tips for finding containers that will work for your child. Special note: If your child has a feeding tube, do a search for Facebook groups or ask your child’s team for resources. It’s easy to fall into a rut but there are new ideas and breakthroughs happening every day. Can your child open AND close the containers you pack? Should the covers be twist tops or snap-ons? Can they open a zippered baggie? Sure, these tasks sound easy but they can be real challenges if you have fine motor issues. Different brands and styles of containers have different benefits, so do a little spying and trial and error. There is no point in spending an hour prepping a picture perfect bento box if your child is unable to get to it. My child could open the Ziploc divided container but never get it closed again, leading to tragically messy and stained lunchboxes!! This must have been a common problem, since the company has discontinued the item. This year we are using Snapware, which seems to be working out nicely and doesn’t leak. Victory! But those side latches could be tricky for some kids so do a trial run before sending anything new to school. Hopefully the school has grown ups on hand to assist with these things, but better safe and full than sorry and hungry. Some kids with special needs will have a meltdown if their foods touch each other. Others will only eat from their favorite bowl or with their own spoon. This is another reason to be sure to have some trial runs or introduce the containers before school begins or on weekends. A child may need some transition time or a chance to get used to a change in a calm environment rather than under stress in a cafeteria. Ask your kids what kinds of cool containers their friends use. Ask other moms what works best for them. Do a web search. But remember, what works for one child may not work for yours. Borrow containers to try them out or bring your child to the store and have them experiment before investing a lot of money in something that might be useless. Just pretend: The sports season just ended and you and the other parents are bursting with pride watching each child receive a participation trophy with their teammates. Of course, we hate to see our children disappointed, so when we notice every kid holding a golden statue, we utter a collective parent sigh: “Oh, good, they all feel special!” Phew! But do our good intentions really help our kids? Not if we really want to nurture our children’s character and base our parenting on solid child-development research. But beware: our good-hearted trend may actually backfire and diminish-not nurture-our children’s self-esteem, character and resilience. 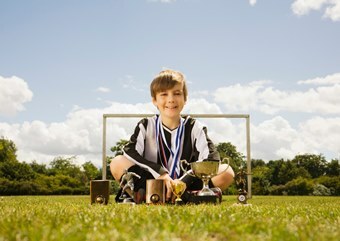 Here are six reasons to stop the “Every kid gets a trophy” trend, and pronto. Our children develop crucial character traits like perseverance, dependability, and trustworthiness by rolling up their sleeves, practicing hard, and giving tasks their personal best. Awarding kids for putting on a uniform is honoring mediocrity-not excellence-and it robs them of the opportunity to strengthen their character. Character is what helps our children become good people and handle life. Let’s not allow our kids to believe that they can take the easy way out, cut corners, and rely on others to do the heavy hitting. Doing so won’t prepare them for the real world. In all fairness, a big reason many parents joined the “Trophy Bandwagon” is because they assumed that it would nurture their children’s self-esteem. But research tells a different story. While that trophy may make a kid feel “special” in the moment, it doesn’t endure. Real self-esteem is gained from praise, pats on the back or trophies that are earned, and kids are quick to recognize they did nothing to warrant the award. Helping kids cope with adversity must be part of our parenting agendas. After all, life has bumps and our children must learning coping skills to ride them out. Children become more tolerant to frustration when they are exposed to setbacks in small doses.That way when those bigger challenges come along they realize they can handle them. Giving every kid a trophy as a means to cushion disappointment from not “being the best,” only reduces their chances to realize that they can bounce back and curtails their capacity for resilience. I’ll never forget when my college-bound son handed me a box of his trophies culled from being on dozens of teams. “They don’t mean anything,” he explained, “everyone has same trophies.” He saved just one medal from a team History Day competition that was well-earned from hard work and passion. If every kid gets the trophy, then their “real win” isn’t special and they fail to reap the joy that comes from realizing that their hard efforts actually paid off. Let’s stop this craze of giving every kid a trophy just for showing up and breathing. The practice is not beneficial to children’s character development. Instead, tell your son or daughter that you are proud that they were a team player and that you loved going to those games or event. 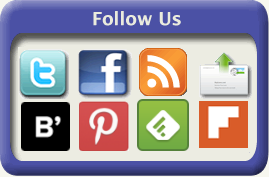 Teachers, Want to Help A Child Learn? Encourage Wiggling! The research is clear, many of us move to think, that means we can cheer for kids who like to wiggle while they learn. Large motor movement such as walking 15 minutes before school, doing moderate-intensity exercise before a test and peddling or bouncing before academics have been shown to improve performance. Small movements such as fidgeting, squirming, leg-swinging, foot-tapping, and chair-scuffling may help us learn new knowledge and work out complex tasks. 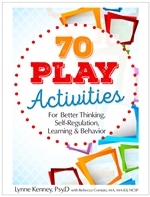 The research is reviewed in 70 Play Activities. Here are 8 science-based ways to improve thinking, learning, and behavior in your classroom. Right around Christmas time, I wrote an article about safely traveling for the holidays with your pet. We touched on many things from car safety (using proper harnesses and seat-belts and being in the back seat) to night-safety guidelines and which ‘tools’ were the best to use and which ones to leave at home (with respect to leashes and collars). If you missed this article, here is the link so you can get up to speed on some important safety information. While all of those same suggestions apply now, there are other things to take into consideration during the hot summer months if you’re planning to include the dog in your activities. Whether you are going for just a day trip, or an extended vacation by car or RV, here are some things you are going to want to keep in mind for safety this summer. Never leave your pet in the car: Just like you’d never leave your child unattended in the car, never leave your dog in one either. It heats up and becomes a furnace very quickly… and since most pets have a ‘built-in’ fur coat, they can over-heat that much faster! Oftentimes we think ‘we’re only running in quickly, they’ll be fine just for those few minutes’. But let’s face it, when traveling with kids, those few minutes can turn into much longer than you expected just trying to corral them back into the car! And don’t forget that Fido might need a bathroom break and to stretch his legs too! Sight-seeing and tourist attractions along the way: If you plan on doing some sight-seeing along the way, map out your trip in advance, and figure out the spots you want to stop at and go sightseeing. If they are indoor spots (like a museum) or a theme or water park, unless your dog is a Service Dog, they are generally not permitted inside. Do your research way in advance, and get some suggestions on local kennels or pet-sitters in those immediate areas, and find out what their availability is, and if you need to make a reservation. *Note: Many of the theme parks such as Disney and Epcot Center have on-site kennels. This way your time with the kids is not rushed and you know your pooch is safe while you enjoy some quality family time together. If they are outdoor spots, like walking or nature trails, a lake to swim in, or picnic spots, and your dog is welcome there (call in advance just to make sure this is still the case) make sure you bring plenty of fresh water for them as well as for yourself and the kids. You never know what kind of bacteria or microorganisms might be living in any specific lake or body of water, so providing frequent drinks for your pet will reduce their ‘natural instinct’ to drink from any source available if they are thirsty. Many pet stores (and Amazon) offer collapsible water dishes that even have a carabineer to attach to your belt-loop. Hot pavement and rocky terrain: Another thing to take into consideration when hiking with the kids and pets…. Consider for a moment all the reasons you wouldn’t have your child hike barefoot. Those same reasons apply plus a few more. On top of the potential for possible cuts from rocks, and burns from hot pavement (some trails are partially paved), while dogs primarily ‘sweat’ through excessive panting, they also have a small amount of sweat glands that are prominently in the paw pads. If the pads get burns, or dry out and crack, it can cause your dog to overheat that much faster. Besides the boots your dog can wear for winter or rain, some new ‘breathable boots’ boots were created with a ‘cool down’ feature which will protect them from overheating as well as prevent cuts and scrapes. I also like to use a product called ‘Musher’s Secret’. This is a wax that goes on their paws and protects them from the heat. 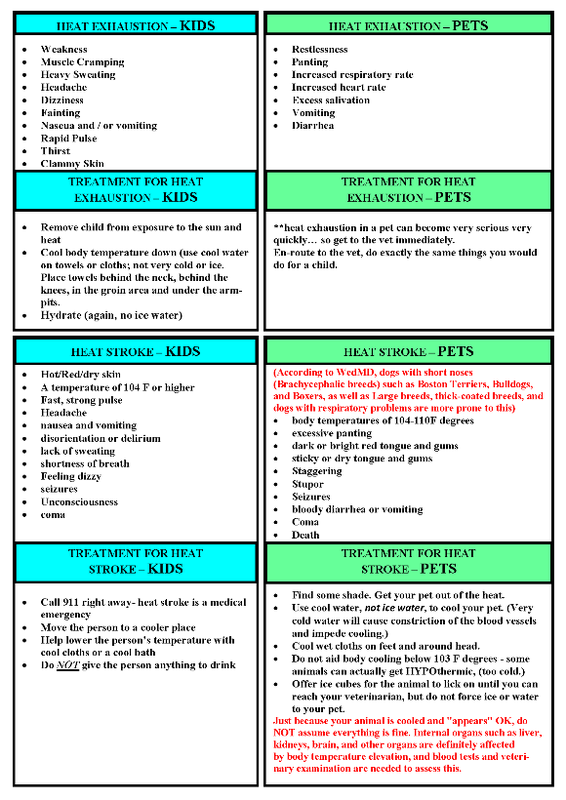 Sunburn: Beyond packing water for everyone (kids and dogs) and making sure they get shade, many people do not realize that their dogs are just as susceptible to sunburns – and even skin cancer – as their kids are! Here is a link to a very informative article to learn more about which dogs are more prone to sunburns, which areas on the dog’s body are more apt to be affected, how to treat it, and more importantly, how to avoid it…and don’t forget to bring sunscreen for your kid’s delicate skin too! Keep your dog on leash at all times: I know, I know…. The point of being out in nature is to explore and be free! And it is fun to give them the chance to be free and watch them explore new things! But what if the ‘new thing’ they want to explore can potentially be dangerous? Like another dog that comes by that is not so friendly? Or a wild animal that they decide to suddenly chase after? Or worse: A child who is AFRAID of dogs, that does not know your dog is a sweet and friendly outgoing mutt that just wants to say hello? Oftentimes, in their panic, they run, and can get hurt. I will be the first to say that as a professional dog trainer, my dog has an amazing recall…. But he is still a dog… not a robot! This is not his every day environment…. and when new and exciting things are all around him, can I 100% guarantee that he will listen to me when I call him back? Nope – not unless I have him on a leash. And please…. Leave the retractable leashes at home! The purpose of the leash is to give you full control at all times. Retractable leashes cannot guarantee that. I recommend nothing longer than a 6 foot leash. One last comment on this: If your dog is friendly and sweet with those he knows but not very social with unknown dogs and people, they may not be a great candidate for hiking trails. Your dog will smell, hear, and see others long before you do. This is your vacation, but others want to enjoy a peaceful quiet walk on their vacation too! 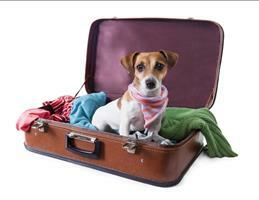 A dog that barks or yaps incessantly, or growls and snaps at others can ruin your vacation and spoil it for others too! Be aware of your dog’s temperament and be considerate of others. Vaccinations and flea and tick preventative: It is important to remember that this is not your backyard… and diseases can be found in many species of wild animals… disease that can immediately affect and harm your dog: and ultimately harm your kids. (see my article about how regular vet visits can help keep your child safe….parts one and two). Also, Make sure your dog is on flea and tick preventative!! Last thing you want are those critters ‘hitching a ride’ on your pet or your kids!! 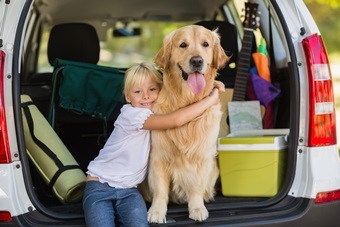 Make sure you do a nightly check of both the kids and pets after a long day of hiking to make sure they are both free of any free-loading cling-ons!! Dog friendly parks: I am going to add one last link that I found to be very informative. A ‘dog owner’s guide to visiting National Parks’. It has some great information on some of the National parks and their rules and regulation regarding dogs. And finally, I’ll end this by saying there are many pet-friendly places to take your whole family (dog included) this summer, but it is vital that you really know your dog and pay close attention to his body language. Unlike your older child who can verbally communicate with you that they are tired and/or hungry… or a baby who gets cranky to convey the same message, your dog cannot tell you what they need or what they are feeling. Being aware of them at all times will enable you to determine when they are enjoying their time with the family, and when they have had enough and need a break. A grumpy tired dog can quickly become an unpredictable one. Don’t forget to do your research in advance, make whatever plans and reservations you need to make, and this will ensure that you, your family, your dog, and others around you will all have a safe and enjoyable summer together! Referees giving parents lollipops at youth hockey games to stop them from yelling at their kids. No kidding! These are the stories I’ve been collecting and have shared on the TODAY show. And these are real issues that are affecting our children’s character. Here’s what to do. ENOUGH! Parents behaving badly is a timeless problem, but there’s a modern-day category of ill-behaving Moms and Dads who could easily earn membership in the Parents Wall of Shame. Their actions are insensitive, manipulative and callous, but also impact kids. Make no mistake, uncivil adult behaviors affect children’s moral development. After all, kids learn values like compassion, honesty, sportsmanship, civility, and respect from example. And oh how today’s kids desperately need good role models! But grownup insensitivity also affects other parents who should be around supportive, civil-minded adults! Here are six bad parenting behaviors that are affecting our kids’ character …and solutions. But what if the parent continues her exclusive “My kid is so special” routine and you want to maintain your relationship? Speak up and explain your side: “You always brag about your child and never ask about mine. I feel you don’t care about my family.” If that doesn’t work, find another friend! Pride about our kids should always be a two-way club. 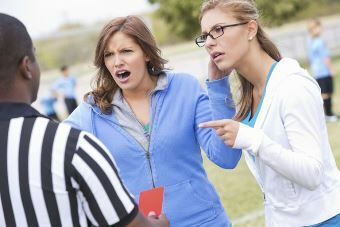 A Reuters News poll found that 60 percent of American adults who’d been to youth sporting events said they’d witnessed parents “become verbally or physically abusive towards the coaches or officials.” But there’s also parents screaming at their kids’ performance and booing the opposing team. No wonder nearly 75 percent of kids who play organized sports quit by age 13! When we think of music, often what comes to mind is song. We may think of Broadway musicals, Bach or Justin Timberlake. In our minds, we might imagine orchestras or pianists. Music has been central to civilization for thousands of years. In fact, before we had language we used musical tones and sounds to communicate. The tone of a grunt signaled a message in our prehistoric ancestors, while the beat of a drum brought village people together in unity far and wide. What we think of a little less often is what music is made of and how it impacts our learning, behavior and social relationships. Music is all around us as we hear the subway cling and clatter, the pitter-patter of our children’s footsteps and the ambient noise inherent in life. Music engages our sensory, motor and auditory pathways in the brain fostering engagement and synchronicity (Patel & Iverson, 2014). Curiously, the ability to synchronize with a beat is associated with learning language and grammar (Corriveau & Goswami, 2009; Gordon et al., 2015). At its core music is made of beats and rhythms that create sound, melody and even movement. These beats and rhythms are meaningful scaffolds we can use in school, at home and in life to enhance foundational aspects of our learning, behavior and character. Here are three ways to incorporate music into your family life to foster growth in learning, behavior, confidence, social relationships and character. TRUST – Engaging in music with your children, classmates and workmates can enhance a sense of cohesion, emotional safety and trust. Our brains and bodies love to entrain, that is, join together in synchrony with others. Moving, tapping and singing in synchrony provide us with a felt-sense of togetherness, safety and trust. Consider for a moment, the smile on an infant’s face as he plays clapping games with his mother. Think about your own emotions as you walk by a classroom of students harmonizing in song. What can you do? Sing more with others. Whether acapella, with the radio or as you complete your tasks of daily living, turn up the music and sing along. Choose songs that are known to all and enjoy the feeling of camaraderie and togetherness as you sing out that tune, together. LEARNING – Even if you aren’t a musical performer, songs, chants, poems and raps are a wonderful way to learn academic knowledge. Music provides a rhythmic foundation on which to layer information in order to encode it and make it learned knowledge. Further, consistent beats, specifically in 4/4 time, stimulate the brain’s natural interest, comfort and familiarity with patterns and sequences. Help your children learn their math facts, historical knowledge, literature and foreign language saying simple repetitive words with rhythm for better encoding and retrieval of learned knowledge. MOVE IT – Clapping, tapping, stepping, marching and bouncing to a beat provide a firm scaffold on which to layer learning. Start by clapping or stepping to a simple quarter note at 85-120 beats per minute and increase tempo as the children become familiar with the beat. On the downbeat add the content to be learned, for example, C-A-T CAT. You can also say the words syllabically, HO – USE HOUSE with a double clap on the fourth beat. Imagine learning your history facts to a beat, “Abraham Lincoln, our 16th president, created Thanksgiving Day, he championed for freedom, as the children played.” Mix and match beats with rhythm, movements, sounds and words for an engaging social experience. The words can rhyme, but they don’t have to. Music is magical. It has the ability to help us calm or energize, connect and reflect, enhancing our thinking skills, learning and character by engaging us as musical and prosocial beings. Enjoy building confidence, character, and social connections as you chant, sing, move, and create to the sounds of music. 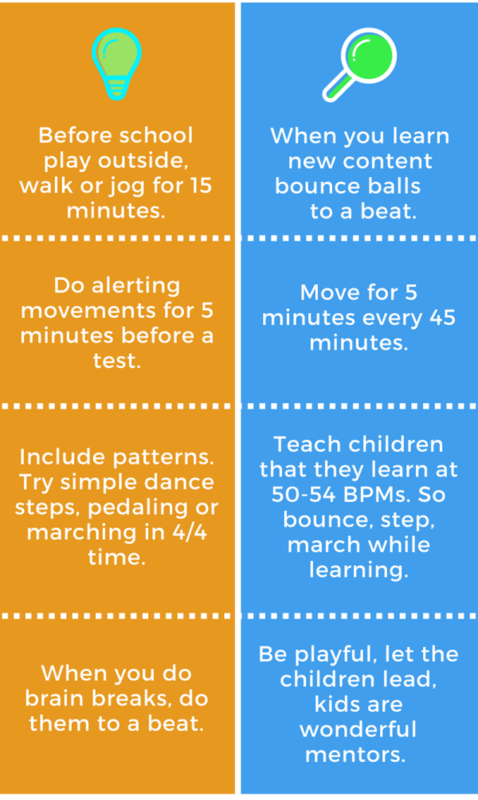 For more musical learning ideas see Musical Thinking and 70 Play Activities for Better Thinking, Self-Regulation, Learning and Behavior. Corriveau K, Goswami U. (2009). 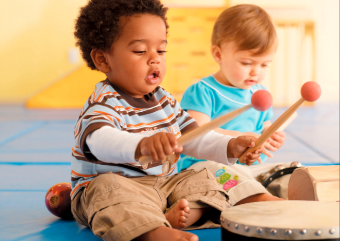 Rhythmic motor entrainment in children with speech and language impairments: tapping to the beat. Cortex, 45: 119–130. Gordon R, Shivers C, Wieland E, Kotz S, Yoder P, McAuley J. (2015). Musical rhythm discrimination explains individual differences in grammar skills in children. Developmental Science, 18: 635–644. Patel, A. D., & Iversen, J. R. (2014). The evolutionary neuroscience of musical beat perception: the Action Simulation for Auditory Prediction (ASAP) hypothesis. Frontiers in Systems Neuroscience, 8, 57.